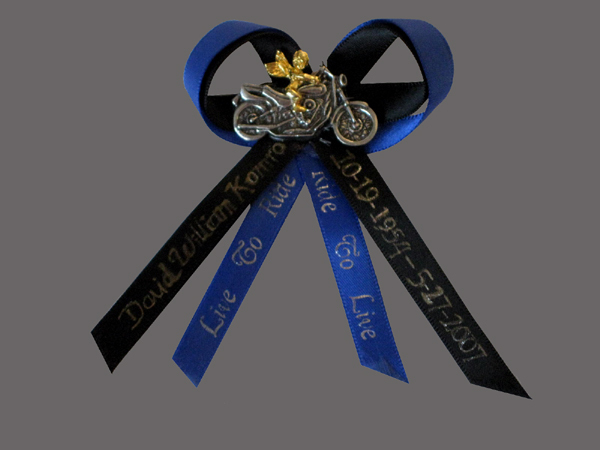 David Komro was a self-taught upholsterer, successful Rohnert Park businessman, father and motorcycling and auto racing enthusiast. His charitable fund-raising helped local teen athletes and many others. 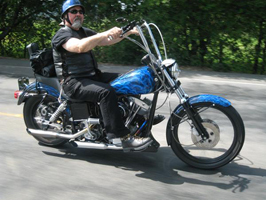 Komro, 52, died Sunday from injuries suffered in a collision while he was riding a 1978 custom Harley-Davidson Shovelhead, a gift from his late cousin. 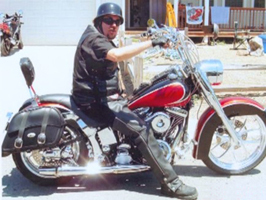 "My dad and that bike were hand in hand," said eldest daughter Serrina DeBaca, the second generation to work at the Rohnert Park business her father co-founded, Le Upholstery Shoppe. He was born David William Komro on October 19, 1954, in San Francisco, the son of Bill and Evelyn Komro. A graduate of South San Francisco High School, Komro trained himself in upholstery, beginning at age 18 in the family's basement. "I don't know where he got the sewing talent," said his mother, now a Sebastopol resident. "He started it on his own." Former wife Tina Mintz and Komro moved to Rohnert Park in 1980 and soon after opened Le Upholstery Shoppe. There, Komro catered to residential and commercial customers -- from people who needed to refurbish couches to those with automobiles, boats, aircraft and restaurant booths that needed recovering. A recent project included a Coddingtown Mall pizzeria. Though Mintz divorced Komro in 1990 and remarried, she and husband Don Mintz and Komro remained closely bonded, sharing holidays and parenting of the Komro daughters, Serrina and Tiffany. "There were never any hard feelings," DeBaca, a Santa Rosa resident, said. "They were always a team." With his grandsons, Komro enjoyed slot car racing in Rohnert Park -- a hobby that earned him nearly 100 trophies during his childhood. 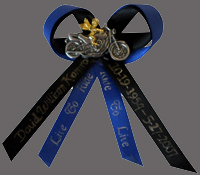 He also worked as a mechanic on sprint cars at the Petaluma Speedway and other tracks in Northern California. He organized fund-raising barbecues and charity golf tournaments to benefit youth sports teams, including El Molino and Rancho Cotate high students. Such efforts also outfitted a Santa Rosa group home with a baseball field and bleachers, his family said. Komro rarely missed Wednesday night dinners with his parents in Sebastopol, a tradition he maintained for the past 13 years. "He did so much good," Evelyn Komro said. "He was always even-tempered, easygoing." Friends and acquaintances, too, could rely on him. "Even if he couldn't financially help them out . . . he'd find a way to help," his daughter said. "He never put himself first." Komro's skin has been donated to help burn victims, and he also gave his eyes and other tissue. 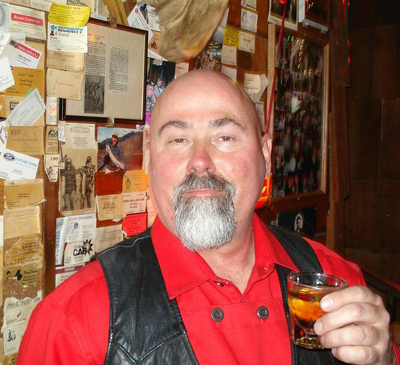 He is being cremated, and the family will scatter his ashes during a motorcycle run. In addition to his parents and daughter in Sonoma County, survivors include daughter Tiffany Komro of Rohnert Park, Ca, sister Kathleen Pedone of Sebastopol and sister Bonnie Boulier of San Mateo. He also leaves two grandsons and was awaiting the arrival of two more grandchildren. The two grandchildren have since been born, Connor David born August 12, 2007 and Sophia Ellena born December 10, 2007.